I have been very fortunate in my experiences as a vet. I have seen quite a wide range of cases that not many vets would have. I feel blessed and quite thankful for that. It has made me a much better and more well-rounded vet. I am simply ready to tackle any species and am so keen to learn more and more each day! I personally enjoy knowing a little bit about everything instead of a lot about one thing because I can always build on my good foundation with more knowledge. I can’t think of any species of animal that will send me running for the hills to hide. I obviously have my preferences and strong suits. I am also very appreciative and absolutely respect veterinary specialists and am always trying to pick their brains about challenging cases. Every vet has his/her niche and I think the best thing a young vet can ever do is to shadow a vet who has honed in on their niche. I feel like I have personally gained heaps of invaluable knowledge from working alongside amazing vets passionate about one specific species (equine, avian or etc) or domain (medicine, surgery or so forth). I never thought I would be so fascinated with reptiles and more specifically snakes but as they say passion is contagious. Tim was a vet who absolutely loved his reptiles and he taught me so much about them and funnily enough I was suddenly more open and keen to learn about and treat reptiles! I got to assist and watch Tim in action. 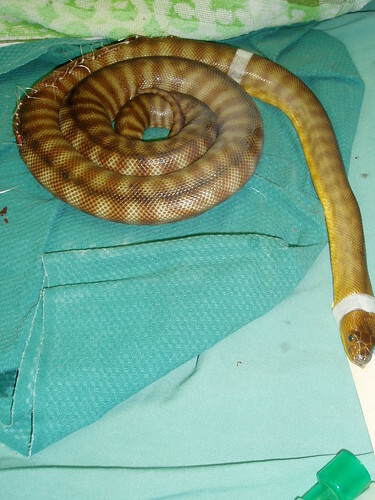 He performed a few surgeries on native Australian snakes that where kept in captivity. They were species of snakes unique to Australia and in dwindling numbers. 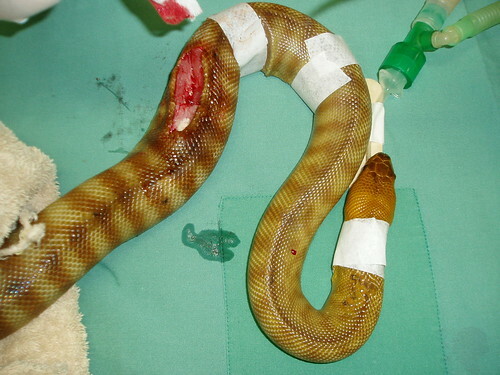 From what I recall, these poor snakes were developing tumours that ultimately lead to their death. 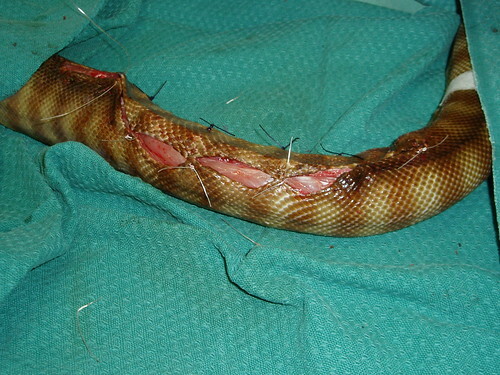 Soft tissue sarcoma, lymphoma, renal adenocarcinoma, fibrosarcoma, and melanoma are the most prevalent tumors in snakes. I will briefly take you through what we did for one particular snake that had developed a very prominent lump. We premedicated it with an intramuscular injection and had to wait some time for it to sedate. Reptiles take time to process drugs. We confirmed it was ready to go to the next step when we could flip it on its back and it was unable to flip back to its normal position. 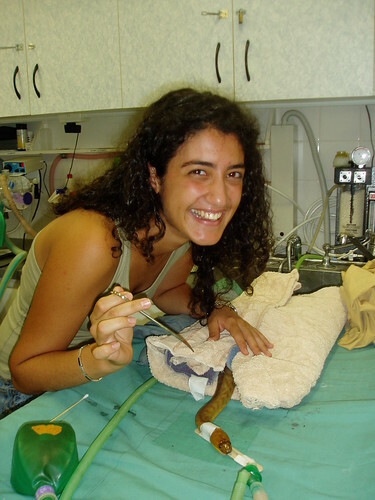 We then passed an endotracheal tube down its airway and had to tape it in position carefully to prevent damaging the snake’s very sharp yet delicate teeth. I then discovered that snakes don’t have a diaphragm and we had to breathe for it during the whole anaesthetic; pretty interesting huh? Well I thought so. To make it even more interesting the lack of diaphragm meant that the snake’s heart could move around. Tim then allowed me to digitally locate and palpate the snakes heart and apply a tape over that location to make it easier for me to find and monitor the heart. It was absolutely incredible because it felt like I was holding the snake’s heart in my very thumbs! He then started the surgery and opened up the lump and discovered a fibrous tumour and he tried to resect it to the best of his ability and sent off the samples for histopathology. He confirmed it was a fibrosarcoma. Patient was given palliative care. 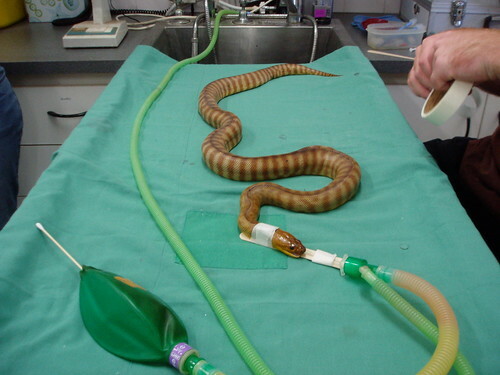 On recovery, we warmed up the snake and maintained it on oxygen. It made an excellent recovery. Unfortunately it presented to us again because the tumour had become more extensive. Tim did not give up and tried again to resect the very invasive tumour and had to even take out a few affected ribs. 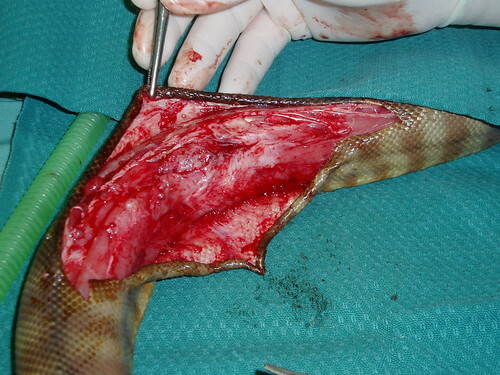 Unfortunately it was very hard to determine the difference between normal and abnormal tissue and so that snake was bound to have a recurrence. I feel privileged to have worked with Tim and will not be surprised to be consulting him about any snakes that come my way as he may well become an expert in this field. 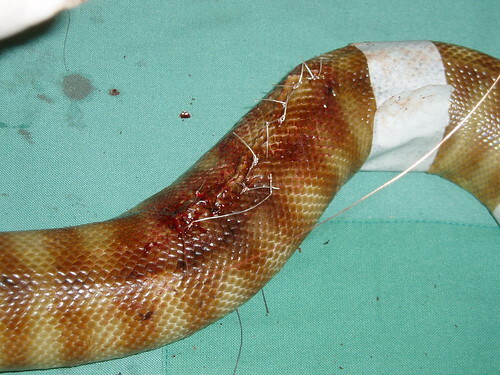 While treating snakes may seem unfathomable to some of you, it is out there and I think it is great. It is important to be able to conserve all species on this planet. Unfortunately I do not recall what type of snake is in the pictures above and I apologise for that. I welcome anyone who knows to come forward. It looks like a Woma Python (Aspidites ramsayi). What a great post! Thanks for sharing. 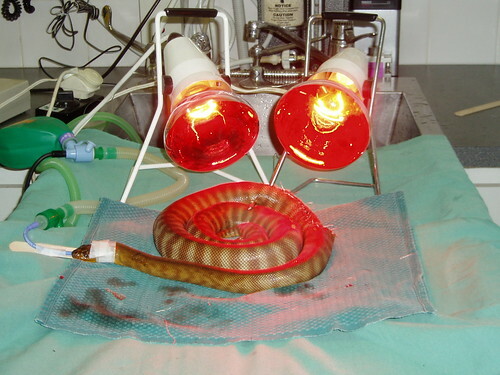 As a snake enthusiast, it’s wonderful to see vet care for them taken to the next level. Thanks so much for identifying our snake patient. I really appreciate it. They are magnificent creatures that is for sure 😉 and we still have heaps to learn about them. Wow! I never gave it a second thought; that people who own snakes would also require a vet. You live and learn. Great post Rayya – even though I’m not particularly a lover of snakes! Thanks heaps Barb. Glad you enjoyed it even though snakes aren’t your thing. :-). I love reptiles, although there are not many common to Wales. It’s so interesting to see a completely different fauna. 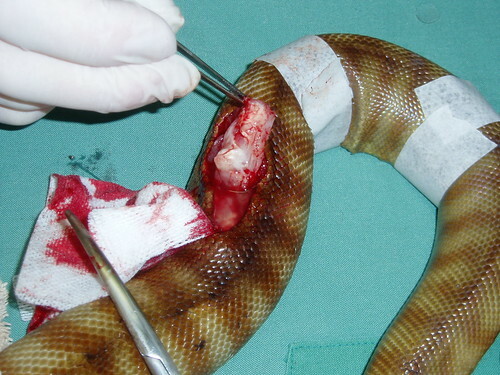 They are pretty fascinating creatures and I agree we also see heaps more snake bite victims as opposed to pet snakes! Glad you enjoyed seeing the op 🙂 and that you have also interacted with snakes first hand. Rayya u guyz did a grt job. i never heard or seen such a good work. i love snakes and what u did to this sweeeetttt little fellow i really appreciate it. I’m late to this party but yes that is definitely a woma python. I have one with many tumours under her skin but over her muscles.. and was looking for more information when I found this page. I’ve had pathology done, one of the larger tumors removed, but she has far too many for removal to be a realistic option. It is not presenting as a normal cancer, pathology has not seen anything like it before. She does not appear distressed and eats and behaves as normal. Hey Melodie. Thanks for sharing your own personal experience. You are doing all you can for your python. The important thing is maintaining her quality of life. I just received news this morning that the histopathology report of one of my boas came back testing positively for malignant firosarcoma. Feel so sad as generally the prognosis doesnt look good.